When Monsanto announced its plans to introduce a new strain of herbicide-resistant soybean seeds and cotton seeds and a new type of herbicide to accompany them, the company promised that its next generation of products would give farmers better control of weeds, “especially tough-to-manage and glyphosate-resistant weeds,” or the so-called Superweeds resistant to Monsanto’s current Roundup herbicide. Superweeds, likely caused by the heavy use of weed-killing herbicides, have created major headaches for farmers, but agriculture companies like Monsanto insist that spraying a different type of herbicide is the answer. Monsanto’s next generation of seeds would be resistant not just to glyphosate, the key ingredient in Monsanto’s current Roundup weedkiller, but also the chemical dicamba, a potent ingredient to be used in the Roundup Ready 2 Xtend formula. Monsanto described its Xtend system as “low-volatility herbicide technology.” But Monsanto’s critics from food safety and anti-pesticide organizations predicted just the opposite, that introducing dicamba-resistant seeds would only lead to more volatile herbicide sprays invading United States farms. 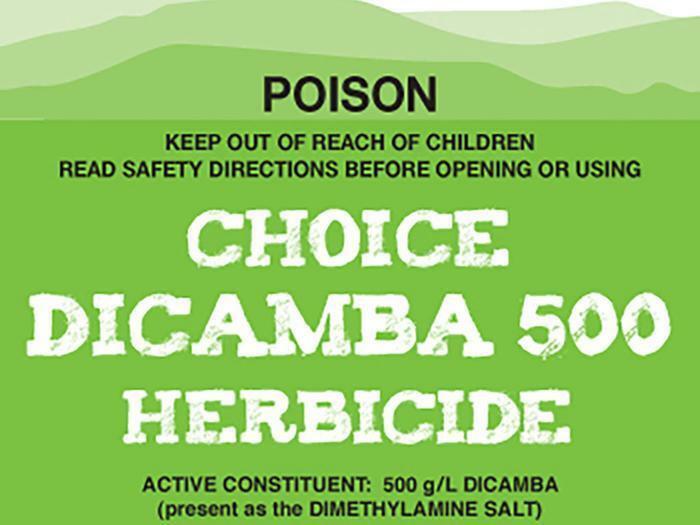 “Dicamba is highly drift-prone,” meaning that Dicamba has a tendency to evaporate in the days or weeks following its application and travel to other crops, wrote Marcia Ishii-Eiteman, a senior scientist with the Pesticide Action Network. When Dicamba drifts onto other plants, the results can be disastrous, she and others argued. “Dicamba is extremely toxic to virtually all broadleaf plants,” or plants that are not grasses, Ishii-Eiteman wrote online. The warnings from environmentalists were not heeded. Even though Monsanto's herbicide had not yet been approved, the United States Department of Agriculture in 2015 allowed Monsanto to sell its new, dicamba-resistant genetically modified cotton and soybean seeds. Late last year, the Environmental Protection Agency finally followed suit, approving Monsanto’s new Xtend herbicide. “EPA’s assessment underestimates the true costs of the proposed new use registration, relies on erroneous assumptions and uncertainties, as well as unenforceable mitigation measures,” the Center for Food Safety wrote in a legal objection. Sure enough, food growers have been complaining that the spraying of dicamba-based herbicides on neighboring cotton and soybean fields is damaging their crops. In August 2016, after the USDA gave Monsanto the green light to sell its new genetically modified cotton and soybean seeds but before the EPA approved the accompanying Xtend herbicide, farmers said that their neighbors were illegally spraying dicamba-based herbicides anyway. In Missouri, the state department of agriculture received 115 complaints about dicamba damage to crops, the Wall Street Journal reported at the time. By September, the Missouri Department of Agriculture reported complaints of damage to more than 40,000 acres of food crops. Last November, Missouri’s largest peach producer Bader Farms filed a lawsuit against Monsanto, saying that the company should be held responsible for the illegal spraying of dicamba herbicides. Bader Farms alleged having lost 7,000 peach trees to dicamba drift in 2015 and 30,000 peach trees in 2016. (Monsanto countered that it should not be held liable for farmers that sprayed unapproved dicamba herbicides). That same month, the EPA officially approved Monsanto’s Xtend spray. “This formulation is different from the products that are alleged to have been recently used illegally,” the EPA said in a press release, explaining that Xtend was less potent than current dicamba-based sprays and came with a special nozzle to concentrate spraying. “EPA continues to investigate these issues in several locations in the Midwest,” the agency added. By 2017, the EPA is expected to approve another dicamba-based spray made by Monsanto competitor Dow AgroSciences. Despite such assurances from federal regulators, food growers worry that the approval of yet more dicamba-based sprays and crops could spell disaster for their industry. The Texas Tribune recently visited one Texas vineyard that, due to crop damage, had not grown any grapes in two years. The vineyard owner, like others, blamed dicamba. "I could see it basically killing the [wine] industry, honestly,” the owner of another Texas vineyard told the publication. Monsanto has not returned an inquiry from ConsumerAffairs about dicamba, but previously, the company has defended its Xtend system much like the EPA has, by saying that its Roundup spray is much less potent and less prone to drift than the dicamba formulations used illegally. Philip Miller, vice president of global regulatory affairs for Monsanto, has previously told reporters that the company has instructed farmers not to spray the older, illegal versions of dicamba. “A discussion of herbicide drift into vineyards comes up often when ‘viners’ and/or ‘winers’ get together. These conversations can become very emotional,” Tom White, a viticulture specialist and former salesman for a large ag dealer, writes in Northern Grape News, a newsletter put out by the United States Department of Agriculture. Nonetheless, he assures growers that it is in the best interest of Monsanto and Dow Agrosciences to avoid lawsuits, and similarly claims that their products will be less potent than illegal formulations.